Life is too short to force yourself to keep reading. 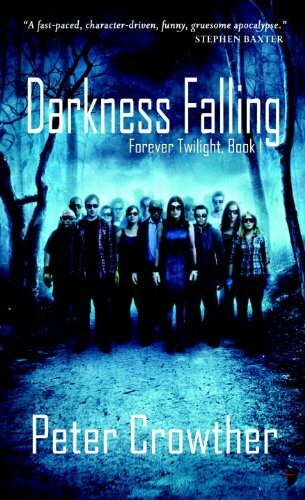 I requested Darkness Falling from NetGalley because I liked the premise: Four people inside a radio station find they may be the only normal people left alive after a strange bright light turns the rest of the town in pod-people zombies. I like zombies. But well-over 100 pages in, imagine my surprise when I have yet to see the walking undead. What I did see was nothing like the blurb… except the white light. The story actually follows about nine or 10 people, scattered in or around Denver. Three are in a plane when the rest of the crew and passengers disappear. My mind went straight to The Langoliers and never left. There is the obvious dismay and confusion that follows, then more of the same once they get the plane to the ground. At the same time, we see the event from the perspective of a serial killer, a schizophrenic and the promised radio station crowd, respectively. It is incredibly drawn out. We get a lot of characterization, which can be a good thing, but it was just too much. I was most annoyed by the exact same revelations over and over again, such as “Why would people close the doors behind them?” when everyone is trying to figure out where the town went. You know what? I would never ask that question, yet the folks in the book did, over and over and over. Another annoyance: a movie or literary reference every five seconds. One or twice could create some common ground between the characters and the audience, but we’re talking like 50 different references. So, back to the zombie thing… I’m more than a 1/3 of the way into the book and I start questioning myself about whether this was really a zombie book after all. So I go to Goodreads and discover two things: 1) While the zombies do eventually make an appearance, the book is basically the set up installment for the series, with no resolution; and 2) It was originally released in 2002… part 2 didn’t come out until six years later and there is still no word on number 3. So I sat there thinking to myself, why on earth would I keep reading this book? Then I turned off my nook. Like I said, life is too short, even if giving up on a book makes me feel like a failure. *After posting this review, a reader shared the following information with me: “Parts 1 and 2 that you mention were originally published as limited edition novellas, and they are included as *part* of Darkness Falling. Darkness Falling is essentially novellas 1 and 2 rewritten with additional material. The second novel in the trilogy is due in September 2012, and the third volume a year later.” Thank you, Stevie J, for correcting my error. I totally agree with you. I use to force myself to read a book I didn’t like just because I felt I had to but lately I’ve had less time to read and more great books in my TBR pile that I’ve finally decided that I won’t make myself finish something I’m hating. I can’t stop reading a book. What if I stop the page before the book would have wowed me? I can see why you requested it though. It sounds very interesting. Parts 1 and 2 that you mention were originally published as limited edition novellas, and they are included as *part* of Darkness Falling. 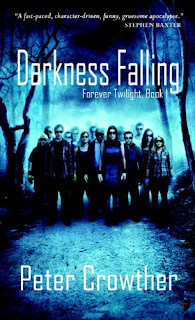 Darkness Falling is essentially novellas 1 and 2 rewritten with additional material. The second novel in the trilogy is due in September 2012, and the third volume a year later. Thanks for the review Jen. Guess what? I’m not reading book 1, 2 or 3.